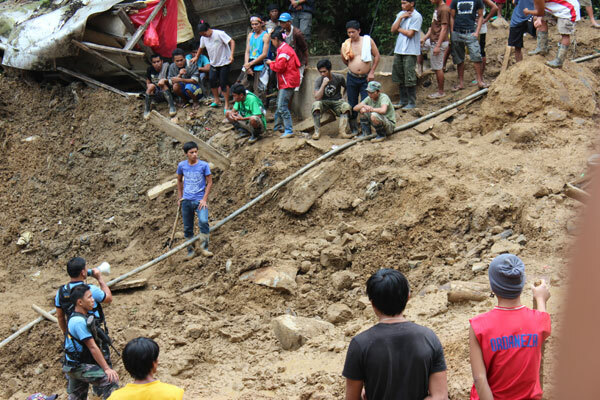 PANTUKAN, Compostela Valley, Philippines — Local authorities and members of the rescue and retrieval operations fear the existence of “leaking” in Sitio (sub-village) Diat Uno will result to bigger and more deadly landslides. The “leaking,” according to them, is a big crack on earth and is the origin of landslides. In January 5, tragedy hit the area as landslide buried residents killing 36 individuals to date, including women and children. Among the casualties, two were still unidentified and 36 are still missing. Rescue and retrieval operations were immediately undertaken but were halted several times due to intermittent rains. Authorities fear another landslide might occur, especially during or immediately after the rains. Around 10:00 AM in Saturday, January 7, after finding one body, rescuers and volunteers from the Diat Small Scale Mining Association (DSSMA) were ordered to vacate the search and retrieval site as light drizzle started. Another temporary stoppage was ordered at about 2:30 PM by the police ground commander Senior Inspector Ireneo Dalugdog when a slight movement of the ground in the uppermost portion of the landslide, above the mine portal of the 700 Tunnel Diat owned by HEXAT mining corporation, was observed. It only resumed after an inspection of an engineer from a big mining company declared that the “leaking” still posed no danger. The “leaking,” according to the residents is “big enough to drop a carabao.” It is feared to cause larger devastation as it is expected to hit the area where most houses in Sitio Diat Dos, a sub-village badly hit in the latest landslides, are located.